Interested in obtaining your B.A. and M.A. in 5 years? Join us for our MHS 4+1 Information Session. The MHS M.A. in the Social Foundations of Health emphasizes interdisciplinary research and critical perspectives on health and illness. The curriculum includes classes with professors in MHS, the Graduate School, and Vanderbilt’s professional schools. Through faculty research collaborations and internships, students will acquire foundational skills that will help them pursue careers, or advanced degrees, in a wide array of health-related fields. Applications are due October 30th. 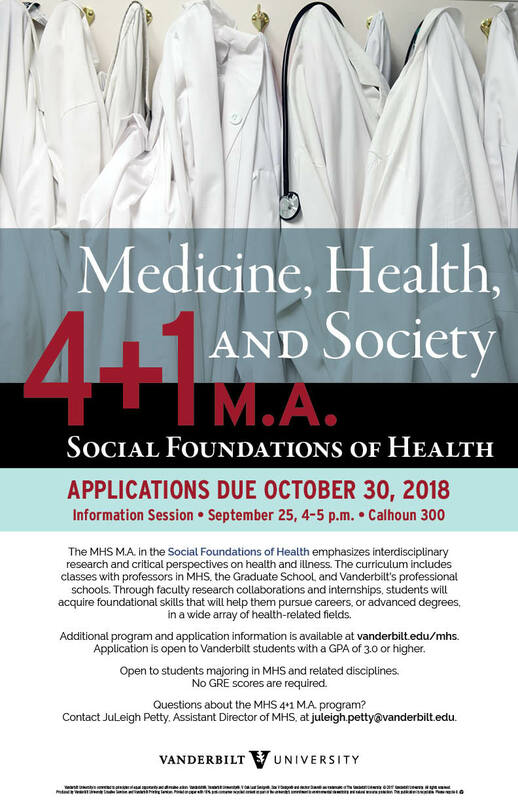 The application is open to Vanderbilt students majoring in MHS and related disciplines with a GPA of 3.0 or higher. No GRE scores are required.